1999 – UN imposes an air embargo and financial sanctions to force Afghanistan to hand over Osama bin Laden for trial. January 2001 – UN imposes further sanctions on Taliban to force them to hand over Osama bin Laden. Sept. 20, 2001 – President Bush warns that the Taliban must deliver bin Laden of they will share his fate (source). Sept. 22, 2001 – Afghanistan’s Islamic clerics asked bin Laden to leave the impoverished country on his own volition (source). Sept. 22, 2001 – Taliban envoy to Pakistan, Abdul Salam Zaeef, states: “Our position on this is that if America has proof, we are ready for the trial of Usama bin Laden in light of the evidence.” Asked if the Taliban were ready to hand bin Laden over, he snapped “No” but his translator said, “No, not without evidence.” He said, “We are ready to cooperate if we are shown evidence.” (source) This was seen as a rejection of Bush’s ultimatum. Oct. 14, 2001 – Taliban offers to turn over bin Laden if the US stops its bombing campaign; Bush rejects the offer (source). June 2002 – Hamid Karzai elected as interim head of state. May 2005 – Details emerge of alleged prisoner abuse by US forces at detention centers. May 2006 – Violent anti-US protests in Kabul, the worst since the fall of the Taliban in 2001, erupt after a US military vehicle crashes and kills several people. August 2007 – Opium production has soared to a record high, the UN reports. June 2008 – Taliban engineers massive jail-break from Kandahar prison, freeing at least 350 insurgents. September 2008 – President Bush sends an extra 4,500 US troops to Afghanistan, in a move he described as a “quiet surge”. November 2008 – Taliban militants reject an offer of peace talks from President Karzai, saying there can be no negotiations until foreign troops leave Afghanistan. February 2009 – Up to 20 Nato countries pledge to increase military and other commitments in Afghanistan after USA announces dispatch of 17,000 extra troops. March 2009 – President Barack Obama unveils a new US strategy for Afghanistan and Pakistan to combat what he calls an increasingly perilous situation. An extra 4,000 US personnel will train and bolster the Afghan army and police, and there will also be support for civilian development. 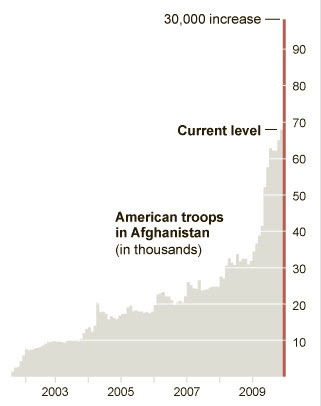 December 2009 – US President Barack Obama decides to boost US troop numbers in Afghanistan by 30,000, bringing total to 100,000. 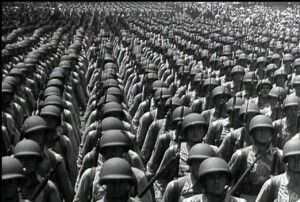 He also says the United States will begin withdrawing its forces by July 2011. May 1st, 2011 – Osama bin Laden is killed by US forces. So the American people, generally, have been willing to accept this war, since it has been so skillfully connected with the Sept. 11th attacks. But this war really has very little to do with attacks on America. We were not attacked by Afghanistan. In fact, Pakistan had (has?) just as strong of ties with the Mujahidin (i.e., Al Qaeda) as the Taliban who governed Afghanistan. We did not attack Pakistan. And if it was a human rights mission to deliver democracy to the brutal state of Afghanistan, we should has started with Saudi Arabia, a primary oil supplier to the US. The point is, we should be fighting the “war on terror” with intelligence, police work, and special ops–not with the military executing counterinsurgency tactics. This strategy has never worked. Ask the British how that strategy worked against the American insurgents they were up against during the American Revolution (AKA, “The War for Independence”). Ask a Vietnam vet how well this strategy worked in that conflict. It does not work. 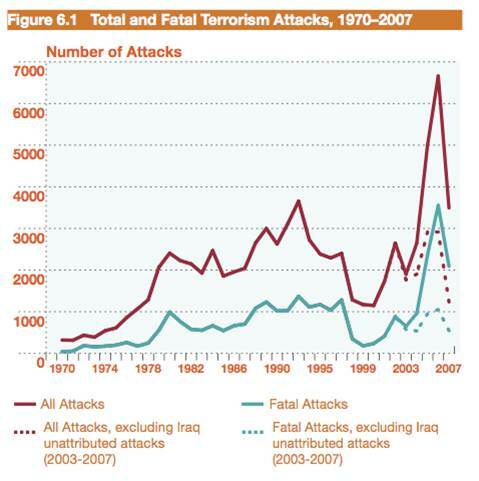 The most troubling aspect of the war has been the rise of terrorism since the war started (source). President Bush was warned by the CIA that there would be a rise in terrorism if we launched a war in a Muslim nation (source: Chomsky, Hegemony or Survival, 2003, page 211; see also link). He was not concerned over the level of terrorism. We can speculate over what he was concerned about, but it could not have been to prevent or limit terror attacks. 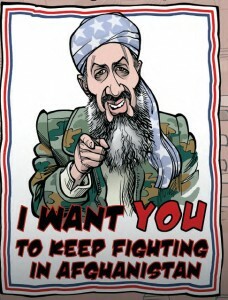 In fact, our decisions have played perfectly into bin Laden’s ultimate strategy. 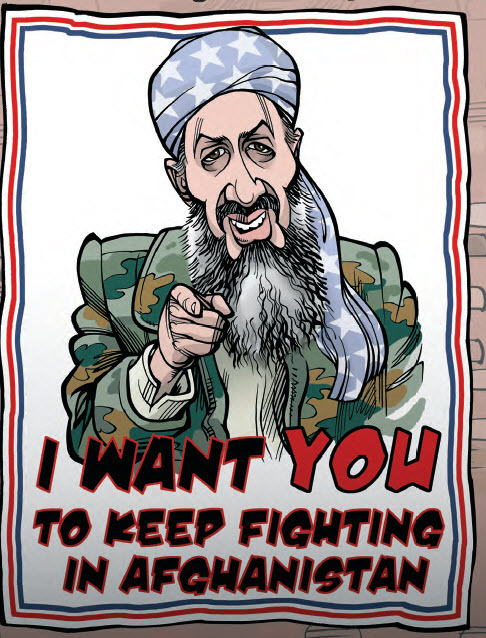 “For bin Laden, the U.S. invasion of Afghanistan was not a threat to his plan for the triumph of his brand of right-wing Islam—it was the central element of that plan” (July 2011). In FAIR’s latest edition of Extra!, Jim Naureckas quotes Abdul Bari Atwan, editor of the London-based Arabic newspaper Al-Quds al-Arabi. Abdul Bari Atwan was one of the few journalists based in the West to interview bin Laden, spending three days with him in the mountains of Afghanistan in 1996. We need to get out of Afghanistan, and completely out of Iraq. We need to open up a national dialogue about what we have learned from these experiences, and create or enforce laws that will prevent them from happening again. We need the media to responsibly report on the futility and horror of these wars. Amy Goodman recently said, “We need a media not brought to us by the weapons manufacturers.” We need to understand that many of our enemies were created by our own actions, and that we can significantly improve peace in the world. And it will not happen unless you and I do something about it. This is a clip of President Obama’s recent speech about the war in Afghanistan. 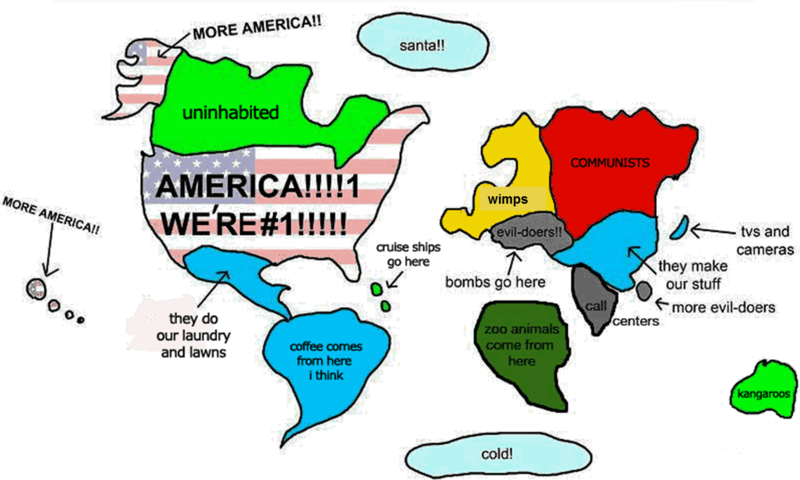 Americans need to understand the world much better than we do. We frequently talk about “leading the world.” And U.S. foreign policy is based on the idea that we make the rules. If we are to show leadership in the world, we need an electorate that understands today’s international challenges. We need to understand what problems exist, and how we can best assist others to solve these problems. Understanding such issues should empower our citizens to elect representatives who will promote effective policy that goes beyond the failing status quo. Here are some interesting—and entertaining—videos clips and charts about what is going on in the world. I hope you enjoy these resources. 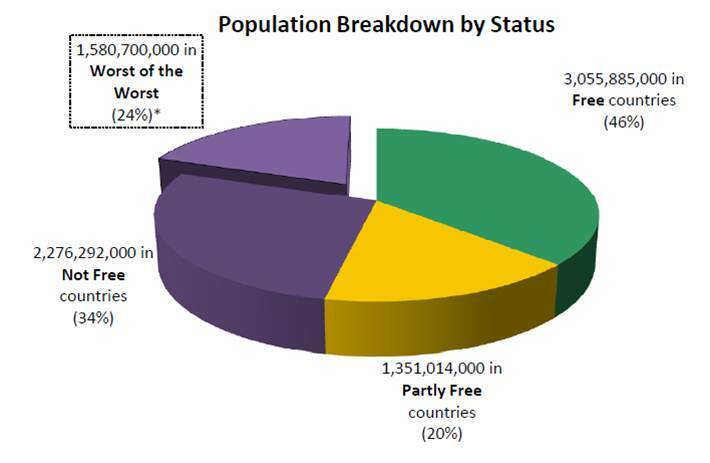 The richest 50 individuals in the world have a combined income greater than that of the poorest 416 million. The military has become an integral part of our economy. What happens when something becomes incredibly profitable?…Will we get more of it, or less of it? Weaponry is one of the last remaining manufacturing sectors in the U.S. We are the largest producer and exporter of arms and munitions on earth. 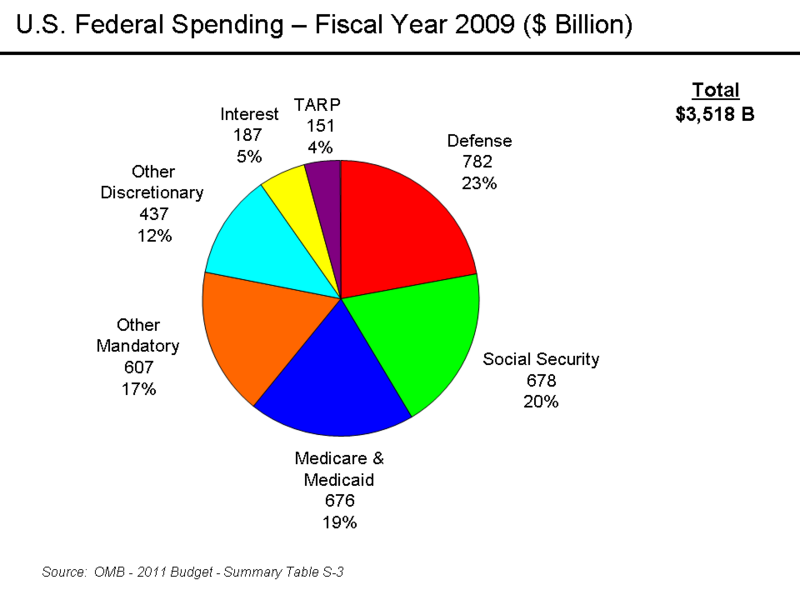 The U.S. Government spends more on the military than all other nations combined—about $1 trillion annually. The cost of our military adds tremendously to the deficit. Conservatives typically ignore military spending and favor cuts in social program instead (what they call “entitlements”; i.e., programs that assist people in need). Of course, it isn’t just conservatives. There are many in congress who have military jobs in their district or state that they aim to protect by voting to maintain (or increasing) military spending. Also, private military contractors make massive political donations that make peace candidates almost non-existent. With these elements in place, it makes it very difficult to rein in our ever-expanding military. We now have over half a million military personnel serving on more than 737 military bases all over the world. These bases are on more than 130 countries. 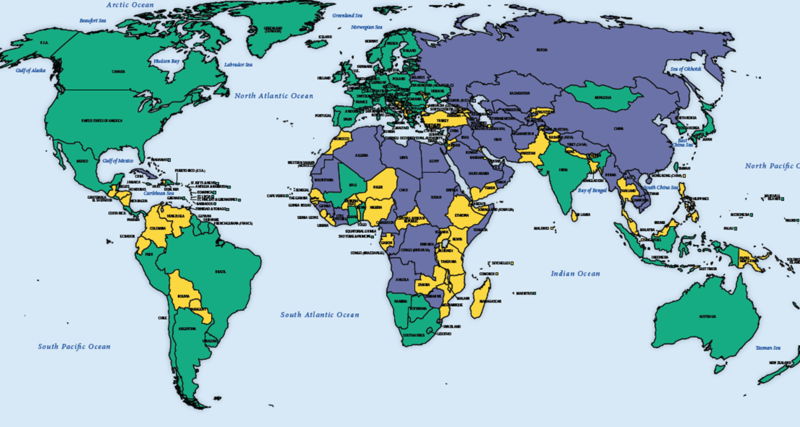 According to the late military scholar, Chalmers Johnson, these bases facilitate the “policing” of the globe and are meant to ensure that no other nation, friendly or hostile, can ever challenge us militarily. He predicts that military spending will “sooner or later…threaten our nation with bankruptcy.” Many would argue that a strong military is necessary because it is a deterrent to potential adversaries. Really? Then explain to me why our tax-payer-funded military bases include a ski center, over 200 military golf courses, dozens of luxury jets, and many luxury hotels. Conservatives like to compare government (public) workers (such as military personnel and Wisconsin teachers) with private workers, insisting, for instance, that Wisconsin teacher, police, and firefighters’ pensions and wages are too generous compared to what private workers are paid (to justify why unions should be crushed). So I am sure they will not want to make the argument that military personnel should have private golf courses and other superfluous luxuries that those in the private sector do not enjoy. Come on! We don’t need 200 military golf courses…but we do need more and better-paid teachers! If we are sincere about the deficit, there are plenty of places in the military to cut–including out-dated Cold War-era nuclear facilities and weapons. NÉSTOR KIRCHNER: [translated] Bush told me the best way to revitalize the economy is war and that the United States has grown stronger with war. Those were his exact words. OLIVER STONE: Were there any eye-to-eye moments with President Bush that day, that night? NÉSTOR KIRCHNER: [translated] I say it’s not necessary to kneel before power. Nor do you need to be rude to say the things you have to say to those who oppose our actions. We had a discussion in Monterey. I said that a solution to the problems right now, I told Bush, is a Marshall Plan. And he got angry. He said the Marshall Plan is a crazy idea of the Democrats. He said the best way to revitalize the economy is war and that the United States has grown stronger with war. OLIVER STONE: War. He said that? NÉSTOR KIRCHNER: [translated] He said that. Those were his exact words. OLIVER STONE: Was he suggesting that South America go to war? NÉSTOR KIRCHNER: [translated] Well, he was talking about the United States. The Democrats had been wrong. All of the economic growth of the United States has been encouraged by the various wars. He said it very clearly. President Bush is—well, he’s only got six days left, right? NÉSTOR KIRCHNER: [translated] Thank God. JUAN GONZALEZ: That was former President Kirchner. And these comments of President Bush that he says about the United States growing strong through war, I don’t think that’s ever been reported anywhere. JUAN GONZALEZ: —forces the productive forces ahead and allows capitalism to continue to exploit. OLIVER STONE: It’s a hard way to die. The American-led war in Afghanistan is not getting better. 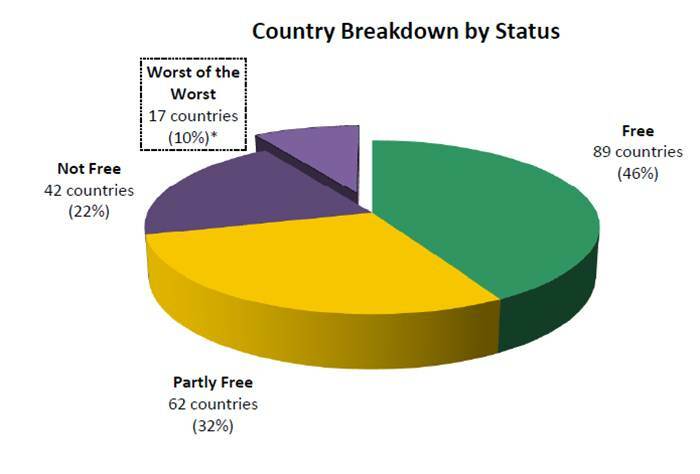 One report found that, “The human cost of the armed conflict in Afghanistan is escalating in 2010. In the first six months of the year civilian casualties – including deaths and injuries of civilians – increased by 31 per cent over the same period in 2009” (source). Since the beginning of the war, over 70,000 civilians have been killed in Afghanistan, and hundred of thousands more have been injured (source). Here are a couple of examples. When the U.S. bombed the caves of Tora Bora in search of Osama bin Laden in December 2001, nearby villages were struck as well. 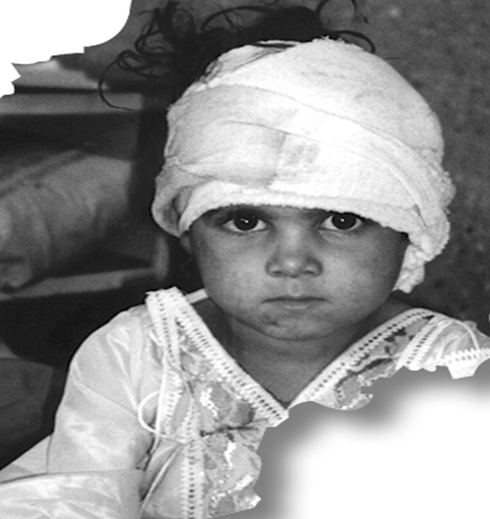 Zeriba Taj, age 3, was hit in the head by fragments of a U.S. bomb. Zeriba’s father and three sisters were killed. It was the morning of November 17, the second day of Ramadan, when bombs struck the small village of Khanabad. Amina was in the kitchen preparing tea and food for the children who were not fasting. Suddenly, the entire building came crashing down around her. She found herself squatting under a few intact beams. The entire room was dark and filled with rubble. Following a light shining through the wreckage, Amina managed to crawl out of what was left of the kitchen only to find her house, which had once stood a few yards away, in complete ruins. Amina ran quickly to her uncle’s house for help. Her uncle and the neighbors who came with him could hardly grasp the horror of the scene. There were dismembered body parts strewn around the yard. Amina’s father, Jama Khan, was the only one found alive under the rubble, pinned down by two beams. The neighbors dug him out. Digging deeper, they found his wife, Bibi Gul, his seven other children, his mother, and his brother and wife and their five children: in all, sixteen family members gone in an instant. Now Amina and Mr. Khan have only each other. It is questionable who takes care of whom. Amina says her father is very ill, emotionally and physically, often unable to sleep at night. Amina also complains of headaches and stomachaches and thinks of her mother all the time. Their house was hit by U.S. warplanes in a battle to chase Taliban forces toward their last stronghold in Kunduz. These stories are tragic. And it is also tragic to see the fatality number for coalition forces. The history of U.S. relations with Latin America is a story of imperialism, exploitation, and crimes against humanity. Eduardo Galeano’s book, “Open Veins of Latin American,” is an excellent introduction to this history. Greg Grandin’s 2006 book, “Empire’s Workshop,” and Naomi Klein’s more-recent book, “The Shock Doctrine,” cover issues of modern economic and military imperialism in the region. From the Monroe Doctrine to the School of the Americas, the tax dollars of U.S. citizens have been used to sell arms to cruel militias, install and uphold brutal dictators, train anti-communist insurgencies in torture methods, implement trade policies that increase extreme poverty and inequality, and undermine democratic movements. But there are hopeful signs on the horizon. I have put together some notable points from various source below, including information about President Obama’s track record in Latin America. For over 40 years, MIT linguists professor and activist, Noam Chomsky, has been a powerful voice of dissent in the United States and around the world. The New York Times has called him, “perhaps the most important intellectual alive.” He has published over one-hundred books, is the most quoted living scholar. I just finished watching an excellent documentary called, “The End of Poverty?” The film explores how international poverty has been perpetuated by corrupt capitalism, through multinational corporations and the U.S. government. The film can be viewed instantly if you have NetFlix, or you can purchase the DVD from the web site. You can also view clips from the film on YouTube. Take a look at the trailer below. 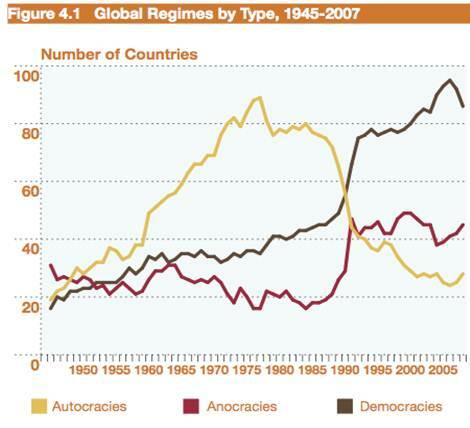 speakingofdemocracy.com is a factual alternative to corporate media, discussing the most pressing issues of our day. Our purpose is to carve out a more-factual, less-partisan, niche in the political blogging world. The intention is not to defend a particular political party, ideology, or a particular issue, but to challenge the established narratives that are spread via the corporate media and the interests they represent, and to do so with academic research standards. © 2019 SpeakingofDemocracy.com · Proudly powered by WordPress & Green Park 2 by Cordobo.